As I am preparing for my workshop in Oregon next week (May 28-29), I am reminded about all the knowledge that goes into creating a beautiful bird and wildlife images. The camera is a view into how we “feel” at the time of taking the pictures. How are we “seeing” at the time of the shoot. These are the human element of photography. It affects our choices of composition, exposure, focus, and use of light. This first photo was partially visualized before I took the image. I saw this flock of Dowitchers from across the pond, and had to go back to a better view-point to photograph them. I walked quickly back, and on the way thought about how I wanted to shoot the images. The lighting was back-lighting, which meant I would either have silhouettes (birds) or major hot-spots. Right after getting to the other-side of the pond, a hawk took to the air, and the flock took flight. They circled the pond, and this is their landing. I like the reflections in the water, and the back-light feathers on the wings and tails. I did crop from the top of the image, to bring the focus to the birds. Each photograph we take has a story to tell. The last two images were not cropped, and show two different stories. The hawk just took flight from a tree top, and this was taken in-between the branches. Thankfully, it was late fall, and the leaves had already fallen. The focus of this image is the eye of the raptor, and the focus plain includes the head, body, feet, and tail. The blur in the wings shows motion. 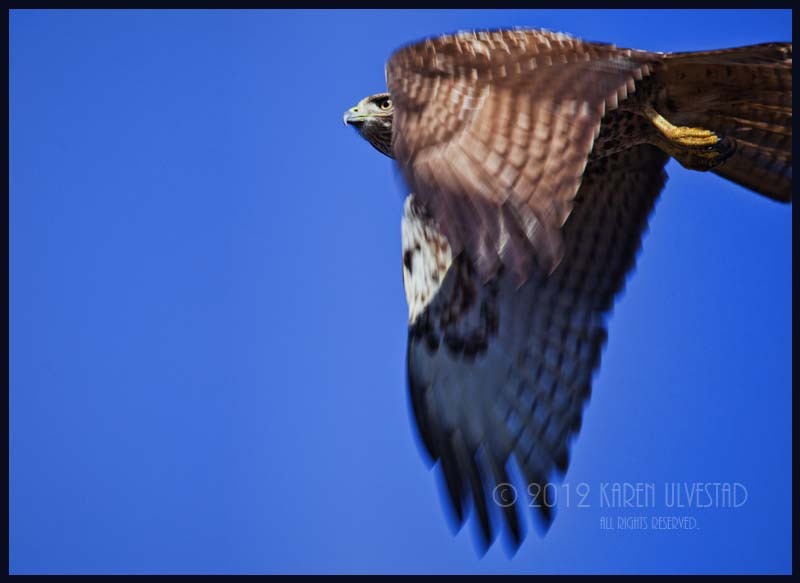 I had studied the hawk for a few minutes before he took flight, and this familiarity allowed me to see the openings for a good photograph. This last image was taken on the Oregon coast. It was a beautiful sunny day, then the fog came rolling in. 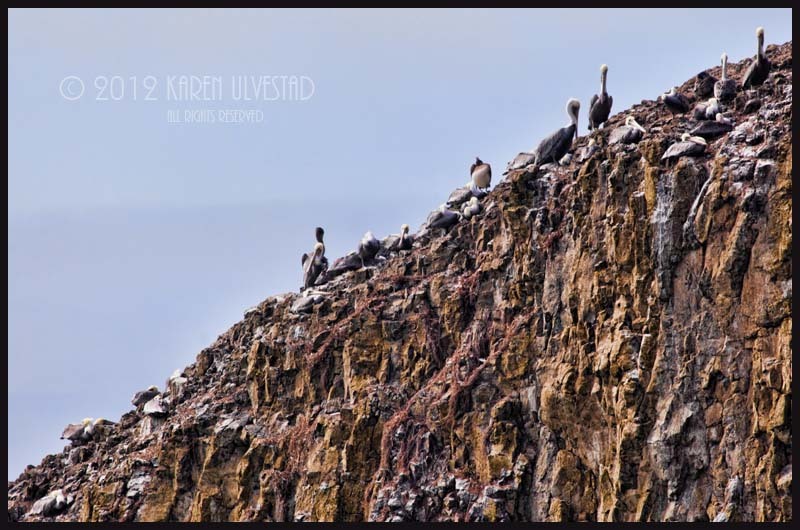 These Brown Pelicans found a resting place on one of the sea stacks. This image shows them preening and resting, before going out hunting later in the day. The clouds/fog brought a soft light onto the subject, and allowed the colors in the rocks to show.